As widely expected, the European Central Bank left its benchmark interest rate unchanged and refrained from any comments about negative deposit rates going forward. Consequently, the euro crossed convincingly above the $1.36 mark, finishing the day 76 points higher at $1.3667, with the inflation risk being seen as 'broadly balanced'. 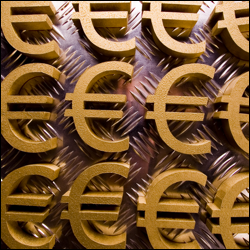 It was a quiet day for the shared currency, with the euro/dollar pair ending a timid 4 points higher at $1.3592. It seems that the Eurozone's trumpeted recovery may have suffered a setback as economic figures indicated a stuttering in the third quarter, with both retail sales and exports showing fresh signs of weakness. Some investors will be hoping that ECB President Mario Draghi will alleviate some of the concerns at the interest rate policy meeting later today. Ahead of the European Central Bank policy meeting scheduled for tomorrow, the euro found enough strength to recover Monday's loss, ending 48 points higher at $1.3589. The driver was the sentiment that concerns regarding disinflation have dissipated and with it speculation that the ECB might ease its monetary policy further. Albeit at a modest pace, manufacturing in the Eurozone climbed by slightly more than expected in October (51.6 vs 51.5) driven by Germany, Europe's biggest economy. However, the euro remained on the back foot against the dollar, losing 48 points to $1.3541 as stronger US manufacturing data left open the possibility of a reduction in quantitative easing. After last month's deflation concerns, which spurred speculation about further intervention from the European Central Bank, Friday's consumer price index figures came in higher than estimates. This indicated that inflation is not a one way street and added some doubt into investors' minds. Therefore, whilst we did see another monthly rise for the shared currency, the EUR/USD pair fell by 30 points on the day to close at $1.3583.